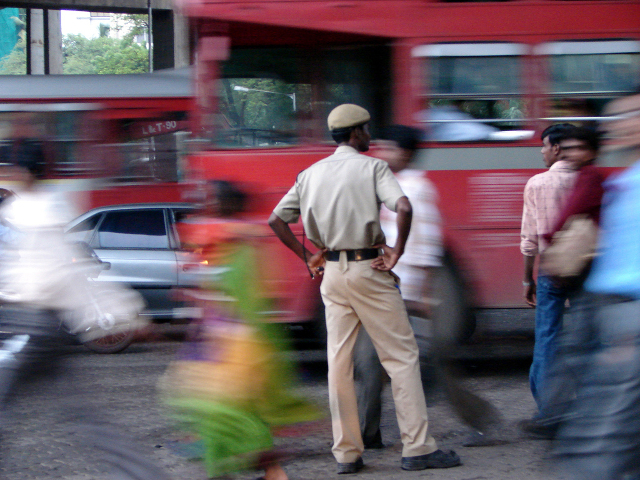 A police force of 3,000 mans Mumbai’s busy streets. Some intersections require more than 5 policemen at a time. Photo by Calamur. Mumbai is an island with little room to grow. In the last four decades, only 900 km (560 miles) of roads have been added, while car traffic increased by a whopping 1,175%. The steep rise in vehicle traffic points to a major shift: more people are choosing to drive a vehicle of their own, rather than rely on public transport. With only 1,000 traffic police on duty at a time, controlling the snarl of cars, buses, and pedestrians is an enormous task. One man is in responsible for taking on this daunting challenge – Vivek Phansalkar, Joint Commissioner of Police, Traffic, Mumbai, coordinates the police force that works to keep Mumbai’s streets moving. Mumbai’s traffic police force is no match for the sheer volume of traffic. The traffic police force is comprised of 3,000 personnel in total, about 1,000 of which are on duty at a time. These officers are left to contend with an enormous population of drivers, and some of the busiest junctions in the world, which demand as many as 5-6 traffic police at a time. Without an adequate force, a large number of junctions go unmanned and effective enforcement is difficult. A High Power Committee constituted by the Bombay High Court is looking to alleviate Mumbai’s traffic problems, by bringing together multiple stakeholders and decision makers. Enforcement of traffic rules is the primary focus of the reforms suggested by the committee. In order to ensure more efficient traffic management and enforcement, the High Power Committee has unanimously suggested that tech-based enforcement will be key to improving the situation. These solutions include ensuring better tracking of vehicles using GPS coordinates and e-challans (traffic tickets) to improve enforcement. These solutions will allow for data sharing amongst agencies, and better record keeping. Effective data sharing would also aid police in tracing stolen vehicles. Multiple agencies – both planning and regulatory – have the ability to affect the transportation situation in Mumbai. These agencies include the MMRDA (Mumbai Metropolitan Regional Development Authority), MCGM (the Municipal Corporation of Greater Mumbai), the Office of the Transport Commissioner, the Traffic Police Department, and the BEST, which runs bus services in the city. Keeping this in mind, the High Court appointed an 11 member High Power Committee to suggest reforms. EMBARQ India was invited to be a part of this High Power Committee, aimed at uniting these disparate agencies in an effort to improve Mumbai’s traffic. The involvement of various organizations is a testament to the realization that effective traffic management involves the cooperation of multiple agencies, even if final enforcement is entrusted to the traffic police. He added that the “onus of enforcement will remain with the traffic police, but once policies and the necessary equipment and wherewithal are in place, enforcement will be [more effective]. Once we are able to implement a large number of suggestions and affect a significant improvement in the city, other cities will also be able to replicate this process”. Mumbai’s city agencies have done an exemplary job of coming together and suggesting measures to alleviate a complex situation. According to Phansalkar, the “ownership of agencies towards the city and their willingness to experiment with innovative technologies on a pilot basis is a leading example for other cities in India”. In asking for different city agencies to come together and work out collective, effective and workable solutions to Mumbai’s traffic issues, the High Power Committee sets an important precedent for other Indian cities. While the process will require time and effort from everyone involved, apart from funding and executive sanction, this is a step in the right direction.